Returning to the origins of cyborg, conceived in order to automatize the homeostasis of human species of Earthlings, augmenting the human organism to conquer the knowledge of outer space, outside the safety zone of planet Earth, this paper re-examines the relation between the outward and inward directed explorations by considering how the journeys beyond the offerings of our atmosphere enable expansion of our noosphere. In order to explore the sphere of the mind – nous, this paper proposes how to consider the wider spectrum of noetics in terms of technoetics, rather than simply and blindly relying on the narrowed aspect of logics in developing future technology. Furthermore, the paper compares the automatization of homeostatic functions of our organism to the compulsion of auto-amputation of organs resulting from irritation of our central nervous system, and considers solutions for decentralising the nervous system by growing new cyberceptive organs. For this purpose the term cyborg (that which turns humans into cyborganic amphibians) is upgraded to the term polyphibian (that which survives and thrives in multiple media). Likewise, the discipline of bionics (that derives its solutions from living systems) is upgraded into a non-discipline of polyphibionics (that derives solutions from living knowledge) in order to encompass multiple forms of being in knowing. Last but not least the paper hints on what remains intrinsically human in rapid transition between the animal and the technological, namely the human use of laughter. As unavoidable autonomous reflex, laughter maintains homeostasis of the mind in the most paradoxical situations and propels us over our own limitations. Should cybernetics incorporate humour to overcome the constraints of logic in technological and computational that is only a part of what could be utterly incomputable reality? 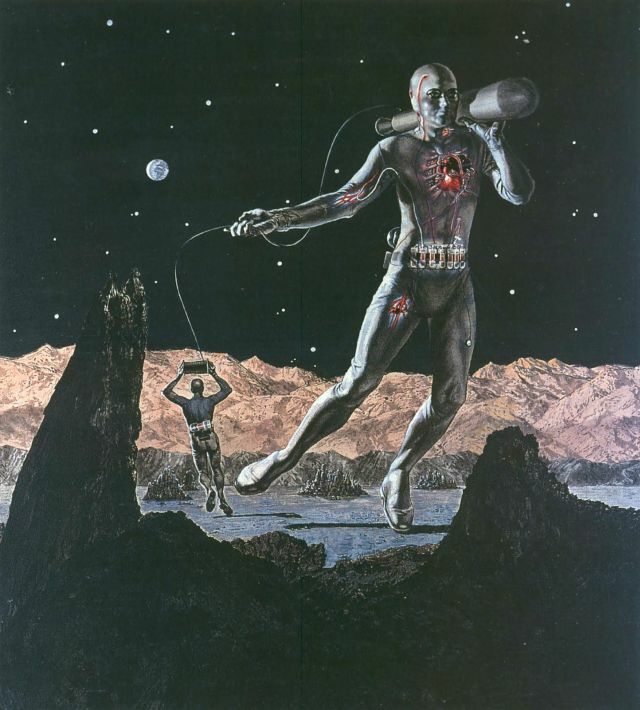 Cyborg was originally defined and designed by M. E. Clynes and N. S. Klinei in order to enable exploration of space, where the lack of gravity diminishes the experience of physiological pressure on our bodies, while the psychological pressure on our minds increases with increasing distance from what we recognise as home. By escaping the troposphere through stratosphere and exiting beyond the exosphere of our planet, the human mind is deprived of mundane, human-scale distractions. Such direct exposure of the human being, cybernetically enhanced to survive in the outer space, free to explore outwards, would result in even deeper introspection, introverted exploration, as noted by D. S. Halacy, for whom the cyborg represented the threshold “between the inner space and the outer space, a bridge between mind and matter.”ii Cyborg is therefore crossing the bridge over the unnecessarily abrupt division between the inner mind and outer matter – the matter of the biosphere that underwent the evolution from the emergence of simplest forms of life on Earth to the complexity of self-consciousness and with it its capability to escape the gravity of Earth – thus transforming and expanding into a noosphereiii – the sphere of nous or human mind. The speculative nature of this paper will further extend the evolution of cyborg’s way of knowing into an imaginary organism of living knowledge. In order to proceed with such imagination the possibilities of expanding the human intellect over the present limits will be briefly addressed. With electrification of communication media overshadowing the Guttenberg Galaxy of print media, Marshal McLuhan warns us of the immanent peril in our exposure to hyper stimulation of our sense organs. Noting how our central nervous system naturally defends itself “by a strategy of amputation or isolation of the offending organ, sense, or function,”xiv McLuhan attempts to apply “the principle of self-amputation […] very readily to the origin of the media of communication from speech to computer.” It becomes clear how “the central nervous system, that electric network that coordinates the various media of our senses” amputates the entire body by displacing itself into a virtual, dematerialised reality of computer networks. The cyborganic augmentations of our being are becoming inevitable requirement for our survival in any medium, in any galaxy. In parallel to Clynes and Kline’s solution of automatized homeostasis for cyborganic amphibians exiting the atmosphere it becomes evident that auto-amputation of our sense organs, to the extreme degree of replacing even our central nervous system with electric network, gives birth to decentralised, dispersed polyphibic consciousness, as an unavoidable solution to survive in the expanding noosphere. Stretching imagination beyond the limits of intellect, reawakens the instinctive and intuitive way of knowing, knowing that is experienced and lived rather than represented and preserved. To harness the power of the dormant instinctive tools we need to reconfigure how these tools are to be reinvented and regrown within us. Invention, augmentation and mutation of organs of knowing are crucial for escaping constrains of the known. If bionicsxx was introduced as a discipline that is to derive its inspiration, its solutions from living systems, then polyphibionics as a non-discipline derives solutions from the non-representable and non-preservable living knowledge. Such would be the knowledge into which a newborn mind is immersed – where everything is experienced as novelty, without abstractions and projections onto the already known. An always newborn mind experiences the phenomena directly, rather than through indirect scientific methods, as one of the greatest polymaths, Henri Poincaré, remarks: if “before each new object we should be as the new-born babe; […] in such a world there would be no science; perhaps thought and even life would be impossible, since evolution could not there develop the preservational instincts.”xxi Direct experiencing as such presents a weakness in ability of surviving, unless we can afford, as cyborgs, to automatize our survival functions, and return safely to the level of plasticity of our newborn state of mind. By extending and exploding cybernetics out of control, beyond the steering of the cyborganic matter into incessant adjusting and awakening of the mind, polyphibionics mutates the cyborg into an ever newborn researcher. vi Roberts, F., 1968. Interview with Marcel Duchamp: “I propose to Strain the Laws of Physics”. Art News, 67(8), p. 62.
xiii McLuhan, M., 1962. The Gutenberg Galaxy. The Making of Typographic Man. Toronto: University of Toronto Press. xxii Molderings, H., 2010. Duchamp and the Aesthetics of Chance: Art as Experiment. Kindle ed. New York: Columbia University Press E-book.